CHICAGO – God, I want to love “The Great Gatsby,” on Blu-ray and DVD from Warner Bros. tomorrow, August 27, 2013. I adore “Moulin Rouge!” and think Baz Luhrmann’s approach to the F. Scott Fitzgerald classic was a daring one. And, watching the film again at home, in a great 2D/HD transfer instead of a garish 3D one, I found more to respect here. The film’s flaws were amplified in 3D and they’re allowed to blend into what works on Blu-ray. The special features also amplify the work by illustrating the incredible amount of detail and work that went into the production. I still can’t get over some of the mistakes made, like nearly every decision made by Tobey Maguire, but the Blu-ray gets me closer. The Blu-ray enhances the film in multiple ways. First and foremost, the film works better in 2D, as nearly all of them do. I can count on one hand the films that I’d rather watch in 3D and while I thought the extra dimension would add to the flourish of “Gatsby,” I found the “flat” version more engaging, encouraging me to get involved instead of pushing the flaws of the film to the surface. I still can’t stand some of the performances here and Luhrmann’s filmmaking feels more cold and calculated than ever but the film is better on 2D Blu-ray than it is on 3D digital film. And the special features are impressive, even if I did hope for an audio track from the always-engaging Luhrmann. He does pop up on numerous special features, including introducing some interesting deleted scenes and offering insight into one of the film’s best elements: The way it weaves jazz, pop, and hip-hop into one of the best soundtracks of the year. It’s the spring of 1922 in New York City, a decadent playground of shifting morals, glittering jazz, bootleg empires and skyrocketing stocks. Chasing the American Dream, would-be writer Nick Carraway (Golden Globe nominee Tobey Maguire) arrives from the Midwest only to land next door to Jay Gatsby (three-time Oscar nominee Leonardo DiCaprio), a mysterious millionaire whose estate overflows with endless parties. As Nick’s beautiful cousin Daisy (Oscar nominee Carey Mulligan) and her blue-blooded husband Tom Buchanan (Joel Edgerton) fall into Gatsby’s orbit, Nick bears witness to a tragedy of impossible love and incorruptible dreams. Based on F. Scott Fitzgerald’s timeless epic, The Great Gatsby mirrors the struggles of modern times in a dazzling visual journey from the mind of Baz Luhrmann, director of the Oscar winning Moulin Rouge. 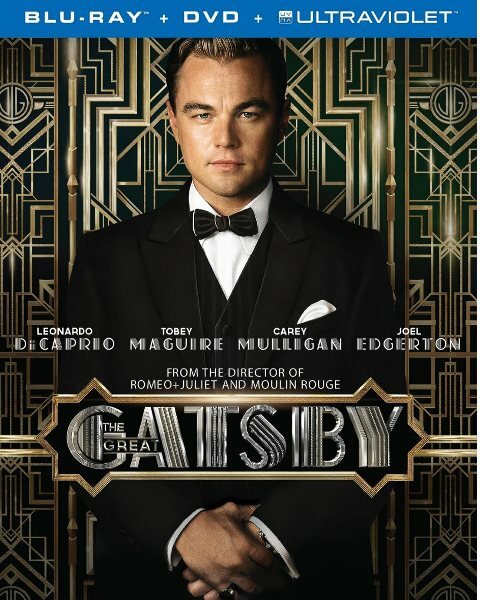 “The Great Gatsby” stars Leonardo DiCaprio, Carey Mulligan, Tobey Maguire, Joel Edgerton, Jason Clarke, and Isla Fisher. It was written by Baz Lurhmann & Craig Pearce and directed by Luhrmann. It will be released on Blu-ray and DVD on August 27, 2013.